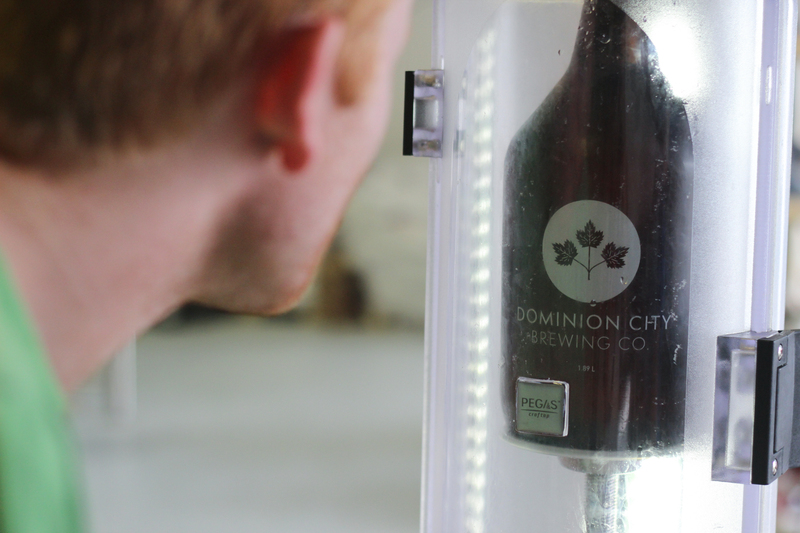 Ottawa’s newest brewery evokes Old-Ottawa charm – talking beer with Dominion City Brewing Co. It was arguably the most perfect day to visit a brewery. The sun was beating hot and heavy, my car windows were rolled all the way down, and I was hollering along to some catchy new Arkells song on my car stereo. I was excited. And thirsty. It was the August long weekend, which meant I had driven back to Ottawa to visit some old friends and my younger brother. One of my favourite things about visiting the Capital after a long time away (since September!!) is scoping out all the interesting new businesses that have thrown open their doors. In fact, I almost fell off my bike looking at all of them. But the one I was most anxious to visit was Dominion City Brewing Co., the brain and beer-child of friends Josh McJannett, Alex Monk, and Andrew Kent. You see, back in March I got an inconspicuous email. It was from my friend Jessey, and it was about a new brewery her friends were involved with opening. Skip forward a few months, and you have me, driving probably a little too fast in search of an afternoon chat about craft beer. Josh McJannett, one of the three founders of Dominion City Brewing Co. I pull up to Dominion City Brewing soon after. It’s less than a week to opening date, and half a dozen-or-so friends are helping clean growlers, bottle beer, and keep spirits high. Josh steps out of the walk-in freezer in shorts down to his knees and black rubber boots that go just as high. Casual Sunday wear when you’re hanging out in the brewery. Beer has been an important part of the three men’s lives. Josh smiles as he tells the story of how he and Andrew found their passion for pints. Around 2003, they, like many other university students, were spending a fair amount of time drinking beer. But for the two friends it was different – they spent their time and money at Vineyards Wine Bar Bistro in the ByWard Market. Sure they were drinking a lot of different types of beer, but they noticed one thing: the local options were limited. It was import-city. The brainstorming and daydreaming began, and two years ago, the friends (with Alex on board) started aggressively planning to open a brewery. After home brewing for years, they’re finally at a point where they have a commercial space to call their own. Of course the beer scene has changed a bit since 2003. For those who don’t know Ottawa, or for those who live under a rock in Ottawa, it’s no secret that the craft beer market is exploding in the city. Beau’s, Kichesippi, Beyond the Pale…all are relatively new ventures in the sipping scene. And they’re all awesome. I can say that because I drank at least one of each of their brews during my short time in Ottawa. So I wanted to ask Josh what he thought was different about Dominion City. Perhaps that’s a null question, because maybe it’s enough that you’re making delicious beer. But still, I thought I’d toss out the question. Fun fact! The inspiration for the three-leaf brewery emblem was inspired by former Prime Minister Lester B. Pearson’s choice design for the Canadian flag. Turns out it’s the link between country and city, urban and rural that Dominion City is hoping to evoke. That idea of place. 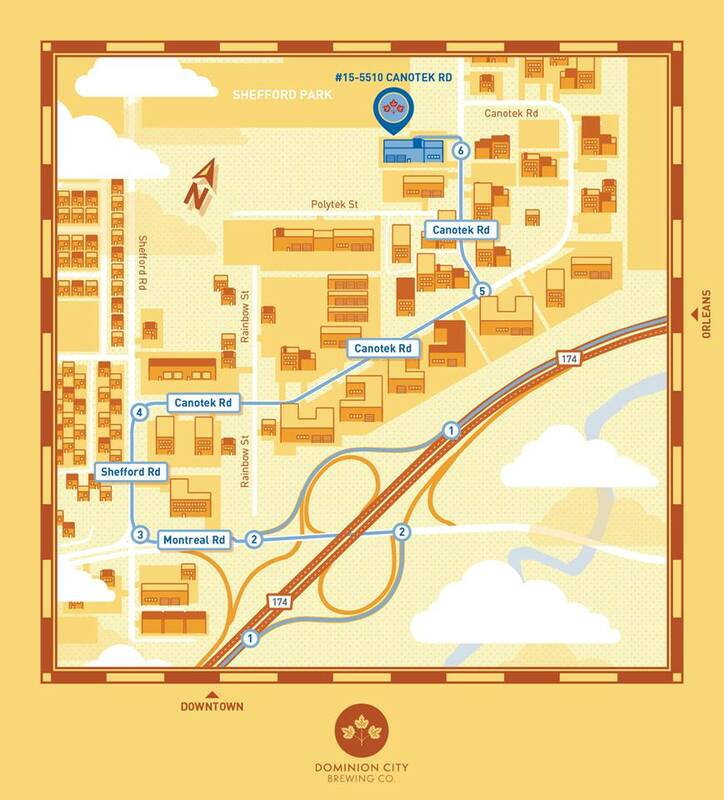 And check it out – the brewery is in the middle of an industrial park in east Ottawa, about as “city” as it gets. But step inside, and your perspective shifts. You see a bar made of 100-year-old pine logs dredged and dragged from the bottom of the Ottawa River. There’s a wall constructed of dark, up-cycled wood planks salvaged from a barn in Almonte. A black-and-white street-scape of old Gatineau graces the edge of the bottle room. The bottle room still in progress, but see those planks. They’re (at least) a century old! How cool is that? Appearance alone does not a brewery make. The beer itself carries the same city-country dichotomy. The local mentality is strong, with spent grains going to hungry piggies at nearby Castor River Farms, and most of their organic Red Fife wheat grown and milled in the Ottawa Valley. It’s local, from design to draft to drink. And while I’m ogling over the prettiness of the bottle house area, Josh is the first to emphasize that this is a working brewery, the real deal. People can see back to the 15-gallon system, the tall metal vats where beer chemistry magic happens. It’s a warehouse. There’s no pretending here, but it’s honest and open and clean. Earl Grey Marmalade Saison: Brewed with freshly-zested oranges and Bridgehead organic Earl Grey tea, this brew has contrasting fruity, spicy, and tart notes, with a dry and moderately bitter finish. 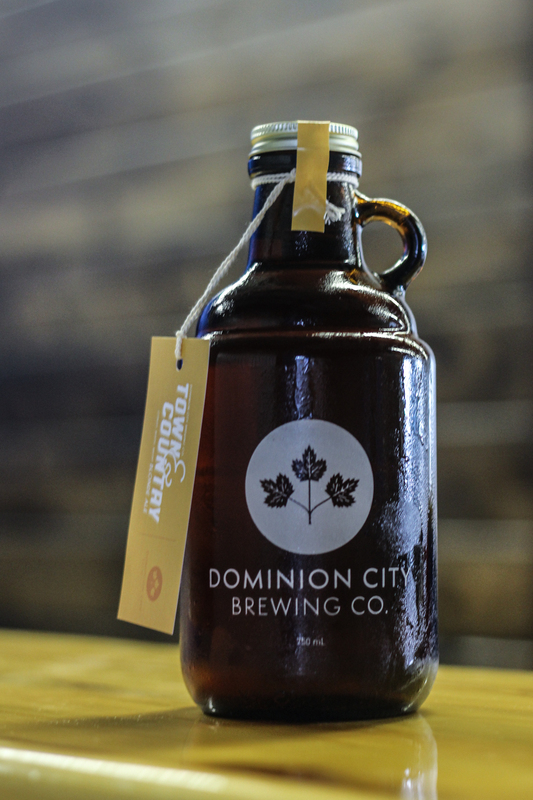 The branding for Dominion City Brewing Co. was designed by Chris Mantil, an Ottawa-based graphic designer. Click on the photo to go to his website. Josh says the brewery hopes to bring in seasonal brews, but is keeping its focus on these three for the time being. The beer can be bought in 1.89L growlers or 750ml grumblers. You might have first heard of Dominion City Brewing Co. through Kickstarter. The crowd-funding website was alight with support for the new brewery, with money being raised to fund the aforementioned bottling room and tasting bar. They surpassed their goal of $15,000, and, in the end, 273 backers contributed just over $19,600. Josh and I agreed – humbling was the word to describe the whole process. Still, the support has gone far beyond the crowd-funding campaign. Dozens of friends have stepped up to help Josh & Co. do everything from washing to bottling to social media work. It’s been a team effort from start until doors open. Speaking of that, it’s happening awfully soon. Tomorrow, in fact. The inaugural public drafts were poured at a party this past Tuesday, with the bottle shop opening its doors this Saturday, August 9. There’s going to be a food truck on hand, and lots of beer to sample. I won’t be in town, but it sounds like a hell of a way to spend a weekend afternoon, right? In the meantime, I’ll enjoy sipping my Town & Country here at home in Sudbury. Cheers to you, Ottawa! Directions on how to get to Dominion City Brewing Co.
For more before and after photos of the brewery space, and shots of the awesome people involved, visit the Dominion City Brewing Co. Facebook page. I sent them a twitter and wanted to know when they are open and they never replied back. Do you know when they will have the next batch ready. Reminds me of Dominion Ale in Newfoundland. Will check it out tout de suite!